Our selection of pre owned trucks for sale are carefully inspected before we consider adding them to our inventory. Most of our units are late model, low mileage vehicles in great condition priced under retail value. We want to be sure our inventory is comprised of trucks with a level of standards that will ensure top value. Purchasing a newer late model truck is a big investment and decision. Rest assured that Clint Holmes Automotive has taken all possible precautions to remove the worries of condition and price from your decision making equation. All you should be concerned about when shopping for a truck is whether or not it meets your personal wants and needs. Full size pick up trucks are the most popular autos on the market and hold value better than any other type of pre owned vehicle. This is why we focus extra hard at keeping up with demand. We will NOT purchase a truck simply because we need inventory. If it’s not something we would own and drive ourselves, we’ll wait until the right ones come along. So if we don’t have the truck you are looking for, be sure to let us know. We can check the availability through our resources and find the one that’s just right for you. A few different brands of Full Size Trucks we offer for sale are Chevrolet Silverado, GMC Sierra, Ford F Series, Dodge Ram, Toyota Tundra, Nissan Titan and more. Body styles can vary from King Cab, Crew Cab, Extended Cab, Long Bed and Short Bed. Most “In Stock” units are very well equipped with trim options and tow packages. We also Warranty EVERY pre owned truck sold if the factory warranty has expired, giving you the ultimate piece of mind. 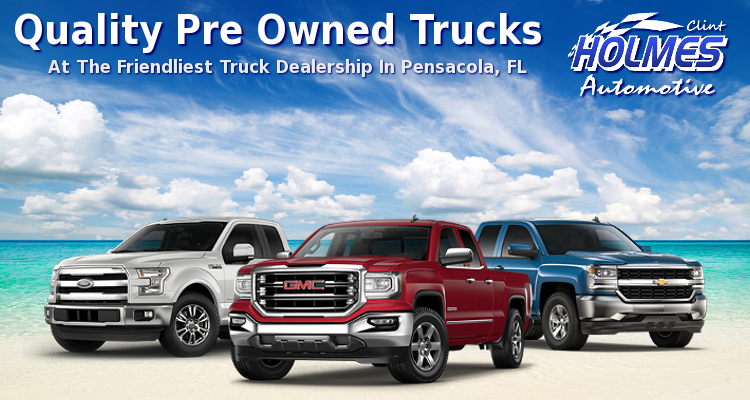 Browse our inventory and give us a call when you are ready to take the next step towards shopping for a pre owned truck in Pensacola.